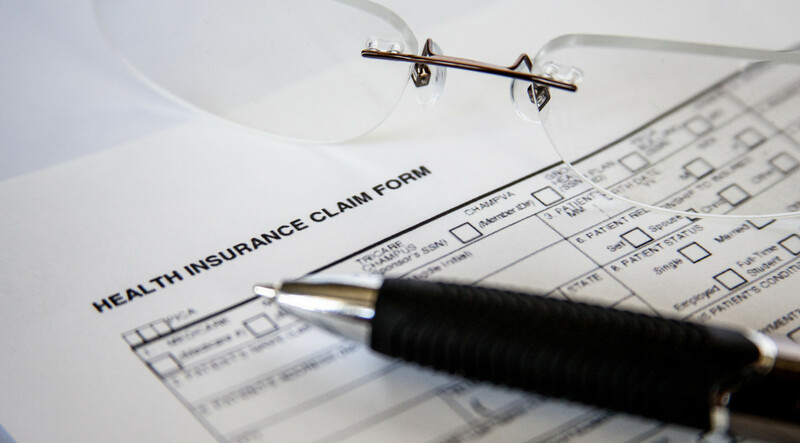 Disability Insurance (DI) programs have long been criticized by economists for their apparent work disincentives. The biggest disincentive arises from the loss of disability benefits when income from work exceeds a relatively low threshold. In response, some countries have modified their DI programs to allow recipients to keep some of their benefits if they return to work, and other countries are considering similar return-to-work policies. For example, the United Kingdom recently introduced the Pathways–to–Work program allowing DI recipients to keep approximately 50% of their disability benefits for up to 12 months after they return to work. Another example is the proposed change in the U.S. DI program, known as the “$1 for $2 offset”. Under this policy, a DI recipient’s benefits would be reduced by $1 for every $2 the person earns above the substantial gainful activity (SGA) threshold. Advocates of including financial incentives in return-to-work policies claim that they increase the employment rate among DI recipients and even encourage some to exit the DI rolls entirely. Thus, they argue, these policies enhance the welfare of DI recipients while reducing the cost of DI programs. A counterargument is that allowing DI recipients the option to return to work and keep a fraction of their benefits makes the program more generous, both for potential applicants and for current recipients. In theory, therefore, return-to-work policies could lead to fewer exits from DI by current recipients and encourage more applications for DI. The challenge in assessing these arguments is that the evidence base for return-to-work policies for DI recipients is scarce. In a recent paper (Kostol and Mogstad 2014), we provide some of the first evidence on the consequences of providing financial incentives to DI recipients to encourage them to return to work. In January 2005, the Norwegian government reformed the DI system, eliminating a discontinuous drop in benefits at the SGA threshold, while leaving in place a reduction of benefits of DI recipients by approximately $0.60 for every $1 in earnings received above the first threshold, and a termination of benefits when they became low enough. However, only recipients who had been awarded DI before January 1 of 2004 were eligible for the return-to-work program. 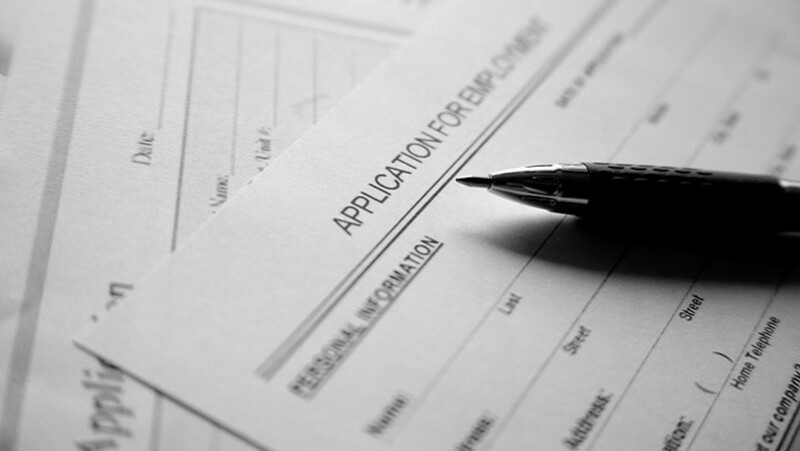 Because the cut-off date for eligibility was set retroactively, individuals were unable to manipulate the award date – for example by rushing their application to gain entry to the program. 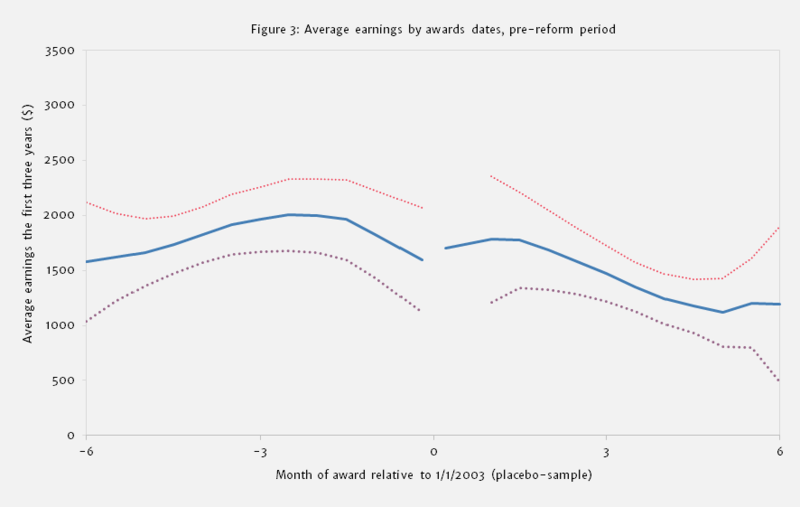 This sharp discontinuity in DI policy provides an attractive setting to analyze the impact of financial incentives using an empirical technique that compares recipients awarded DI just before January 1 of 2004 (i.e., the treatment group) and just after that date (i.e., the control group). 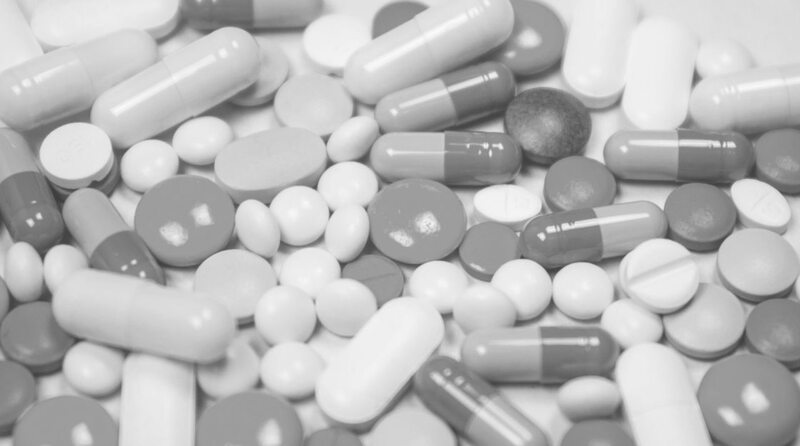 How does income change for workers in the treatment group who choose to work? In Figure 1 we show the incentives at play by translating the Norwegian benefit formulas into a graph with weekly income (in USD) on the vertical axis, and hours per week on the horizontal axis. For simplicity, the comparison disregards income taxation and dependent benefits, and considers the wage and benefit levels associated with a typical DI recipient, setting the hourly wage equal to the rate of similar workers who are not receiving DI benefits. Weekly income under the benchmark rules, which determines the incentives of the control group, is displayed by the black solid line. When the recipient does not work at all, the DI benefit is $560 per week, the height of the blue line at zero hours per week. As the recipient begins working, weekly income increases and is equal to the sum of the $560 in DI benefits plus the earnings from employment. However, once the worker reaches the SGA threshold ($1,050 per month/$260 per week, a bit over 10 hours per week in the example), recipients lose about 20 percent of disposable income. This sudden drop in weekly income is the key difference between the two programs. 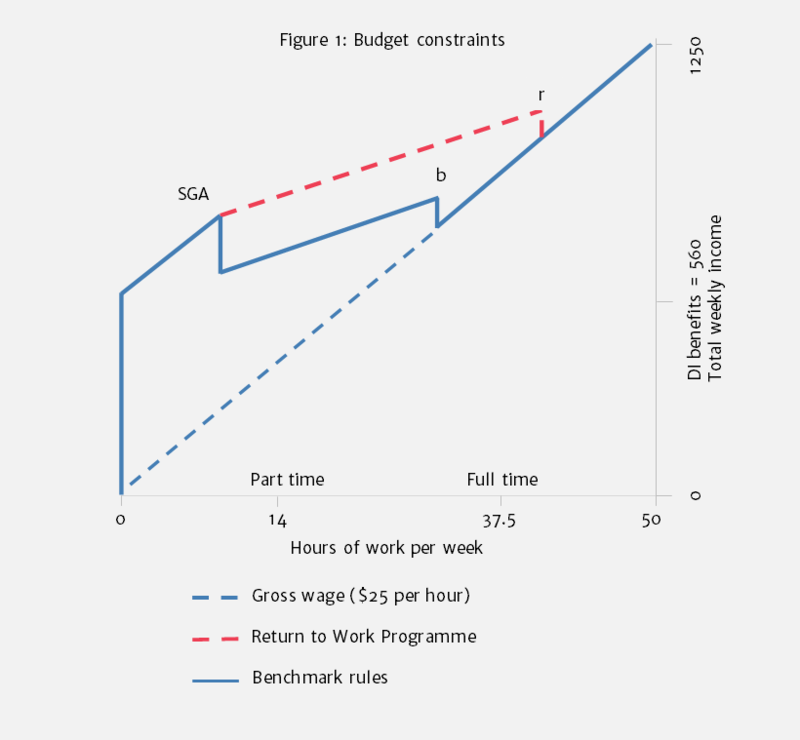 The return-to-work program shown as the red dashed line, which determines the incentives of the treatment group, replaces the cash cliff at the SGA threshold with an offset of $0.60 for every $1 earned above this point. 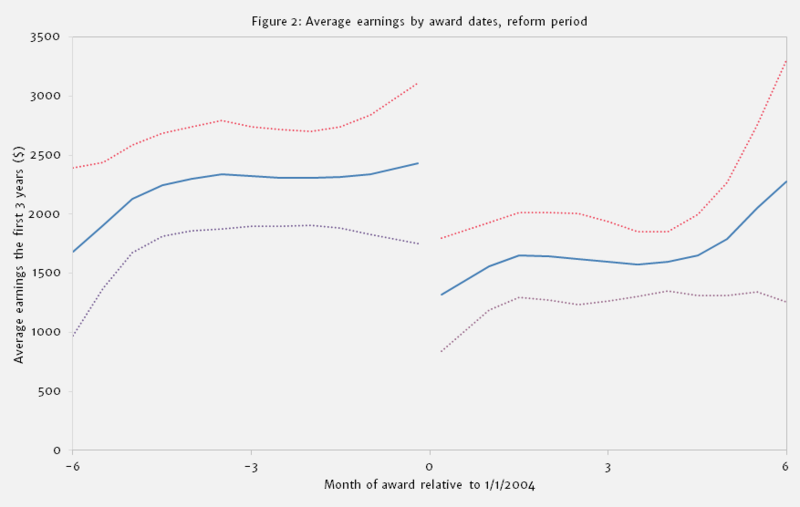 The return-to-work program also shifts the maximum permitted earnings level outward (from b to r in the diagram). How do we expect the return-to-work program to affect recipients’ working hours? The short answer is that it is theoretically ambiguous. To the extent that people can adjust hours freely according to their preferences, we expect people who are close to the SGA threshold to find working more attractive. But those who were already working above the SGA threshold may take advantage of the extra income to reduce their hours of work. Also, those who had been working above r may reduce hours back to r in order to claim at least some benefits. As a result, the sign and magnitude of the average impact depends on the size of the groups exhibiting these different responses. However, there are few members of the control group that earn more than SGA, so it is therefore likely that the return-to-work program will increase average earnings and income, and that it will reduce average benefits. To estimate the behavioral responses to the changes in financial incentives, we use a regression discontinuity (RD) design that compares recipients awarded DI just before January 1 of 2004 (i.e., the treatment group) and just after that date (i.e., the control group). While we refer to [Kostol and Mogstad 2014] for a detailed discussion of the RD design and the empirical results, Figures 2 and 3 provide a graphical illustration. The sample used in these figures comprises recipients below the age of 50 when they were awarded DI. The only difference between the figures is that Figure 2 is limited to awarded applicants during the period from July 2003 to June 2004, while Figure 3 uses awarded applicants from one year earlier. Figure 2 shows how the average earnings during the first three years following the reform differ for those who started benefits just before (eligible) or just after (ineligible) January 1 of 2004. The graphical evidence clearly suggests that the return-to-work program had substantial effects on the labor supply of DI recipients: earnings drop discontinuously as we move from the left of the cutoff date (i.e., the incentives are determined by the return-to-work program) to the right of the cut-off-date (i.e., the incentives are determined by the benchmark rules). In contrast, there is no sign of discontinuous changes in labor market outcomes around January 1 of 2003 in Figure 3; this finding is reassuring because there were no changes in financial incentives to work around this date. The analysis provides three key empirical insights. First, many DI recipients can be induced to work by providing financial work incentives. Three years after implementation, the return-to-work program increased the labor force participation of DI recipients aged 18-49 by as much as 8.5 percentage points. In comparison, 3.4 percent of the control group participated in the labor force, and the labor force participation among rejected DI applicants of the same age was just above 30 percent. Second, the return-to-work program produced a substantial increase in the earnings of DI recipients. These gains in earnings were accompanied by a small increase in disposable income and a substantial reduction in the cost of the program. The reduction in costs is attributable to a significant decrease in benefits and a small increase in the taxes paid by DI recipients. Third, there is significant heterogeneity in the responsiveness to financial work incentives, indicating that targeted policies may be yet more cost-effective in inducing DI recipients to return to work. Among DI recipients aged 50-61, who are approaching the retirement age, there is no evidence of any impact of the program. Within the group of DI recipients aged 18-49, the estimates vary substantially, with the strongest responses to financial incentives among males, individuals with high education levels or more labor market experience, and people in areas with low unemployment. To assess the validity of our results, we perform a number of specification checks, all of which support our main results. In the paper, we also take several steps to shed light on the generalizability of our findings to other DI systems. We begin by describing similarities and differences between the DI systems in the U.S. and in Norway. Next, we use the approach proposed by Bound (1989) to assess the work capacity and responsiveness of DI recipients to financial incentives. When applying this approach to the Norwegian data, we obtain estimates that are quite similar to the recent U.S. evidence. This indicates that DI recipients in the U.S. might be fairly comparable to those in Norway, lending some support to the applicability of our analysis of the return-to-work program to other DI systems. Our study adds to a fairly small literature on the consequences of providing financial incentives that encourage DI recipients to return to work [Hoynes and Moffitt 1999, Benitez-Silva, Buchinsky, and Rust 2010]. There are a few more studies examining policies that encourage work effort among DI recipients using non-financial incentives, but the number is still limited and the results are mixed [Adam, Bozio, and Emmerson 2011, Borghans, Gielan, and Luttmer 2014, Moore 2015 , Campolieti and Riddell 2012]. 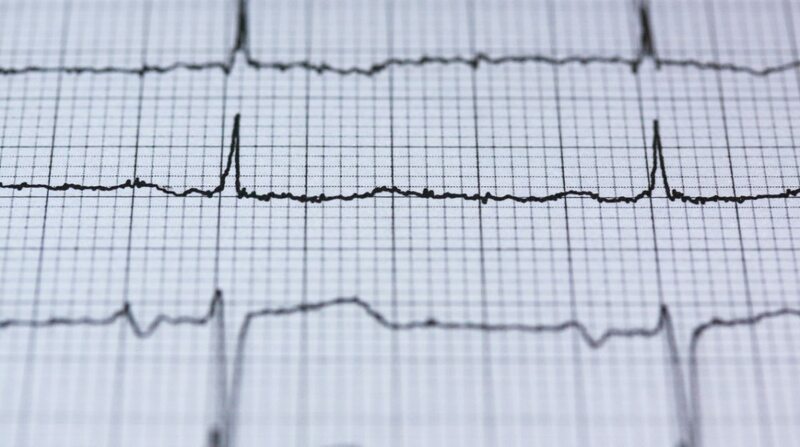 We contribute to the literature by showing that there are a subset of individuals who are deemed totally and permanently disabled by the Social Security Administration who nonetheless have considerable work capacity, and that their labor supply is fairly responsive to changes in financial work incentives. An important caveat to our study is that we are unable to make a statement about the number of new entrants to the DI program that might occur if recipients are given the option to return to work and keep a fraction of their benefits. We do, however, make a calculation for the size of the induced entry that would have to be generated by the return-to-work policy to lead to an increase in program costs. Our calculation indicates that the number of new entrants would need to be much higher than what the existing literature suggests [Gruber 2000] for program costs to go up. Adam, S., Bozio, A., and Emmerson, C. (2011). “Reforming disability insurance in the UK: Evaluation of the pathways to work programme.” IFS Working Paper. Benitez-Silva, H., Buchinsky, M., and Rust (2010). Induced entry effects of a $1 for $2 offset in SSDI benefits. Working Paper SUNY-Stony Brook. Borghans, L., Gielen, A., and Luttmer, E. (2014). “Social support substitution and the earnings rebound: Evidence from a regression discontinuity in disability insurance reform.” American Economic Journal-Economic Policy, 6(4):34–70. Bound, J. (1989). “The health and earnings of rejected disability insurance applicants.” American Economic Review, 79(3):482–503. Campolieti, M. and Riddell, C. (2012). “Disability policy and the labor market: Evidence from a natural experiment in Canada, 1998-2006.” Journal of Public Economics, 96:306–316. Gruber, J. (2000). “Disability insurance benefits and labor supply.” Journal of Political Economy, 108(6):1162–1183. Hoynes, H.W. and Moffitt, R. (1999). “Tax rates and work incentives in the social security disability insurance program: Current law and alternative reforms.” National Tax Journal, 52(4):623–654.